Over the past two years, we have released much of our toolset as open-source code: Backbone.js, Underscore.js, Jammit, CloudCrowd, and others. Today, we’re launching another piece of DocumentCloud — both on DocumentCloud.org and as a component you can integrate into your own projects. VisualSearch.js is a rich search box for real data. It enhances ordinary search boxes with the ability to autocomplete facets and values for sophisticated searches. 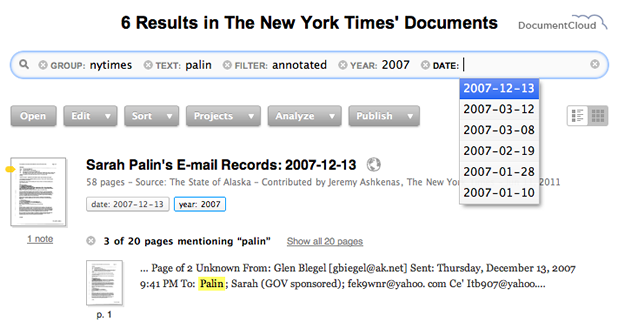 For example, here’s a query that filters The New York Times’ copies of Sarah Palin’s recently-released emails. First we filter just the annotated emails, then just the emails from 2007, and then drill down to a specific date. Visual search works with the arbitrary metadata you’ve already added to your documents. We are excited to not only see what clever uses developers come up with for VisualSearch, but also what additions you write that can be merged back into the main repository. This is very cool. We’ll be looking to implement that in our customer support system so people can easily filter their search results. I love the fact that you guys are contributing back to the open source community! As long as you’re focused in the search box, “delete / backspace” should delete characters. If you’re not focused in the search box, many browsers use “delete” to mean “go back a page”. Is there a particular sequence of characters you can type in the search box that will allow us to reproduce the issue? Yes if you hold down the back button on OSX the browser will eventually catch it as a “browser-back” instead of “character-delete”. I’m guessing as it focuses in and out of pseudo input fields. Huh. I can’t reproduce that in Firefox, Safari, or Chrome on OSX. Holding down the delete key just eats up the text back to the beginning of the box, and stops there. On IE9, I am on the Sarah Palin example page, and I hold backspace, which deletes some things and then does a bunch of back buttons. On Opera, on the Sarah Palin example page, I press backspace and it only deletes the values (like 2007) and not the attributes (like YEAR). If I press it again, it will do a browser back. The focus is always in the textbox.